At the risk of jinxing things, it looks like Summer is finally on the horizon! Rising temperatures (even if they're interspersed with rain showers) have me dreaming of holidays and sunshine filled fun, and nothing sums up that sartorial freedom than the current crop of nautical styled clothing. When I think of the nautical trend, it conjures up images of soft denim, deck chair stripes and a palette of blue with white and red accents. It's casual, but often with a touch of Riveria chic and Coco Chanel glamour. With that in mind, I've picked out a few of my favourite items which would be perfect for any holiday suitcase. (l-r) Soft Denim Tunic (£35) and Short Rope Belt Soft Denim Skirt (£30) both from JD Williams. JD Williams have got casual chic down to a fine art this season, with this Soft Denim Tunic (£35) being a key wardrobe staple. Team with simple white pumps for a casual look, or red heels if you want to dress it up. The Short Rope Belt Soft Denim Skirt (£30) ticks boxes for both 90s and nautical trends. Cute and casual, the rope adds a sweet beach ready nod to this easy to wear style. Add a striped vest for something casual or a Bardot top with a silk scarf to smarten it up. (l-r) Plus Stripped Jersey Top (£26), Stripe Canvas Pumps (£20), Striped Beach Bag (£20) all from M&Co. M&Co have got you set for a casual stroll to the beach, with stripes galore featured in their plus size and accessories range. 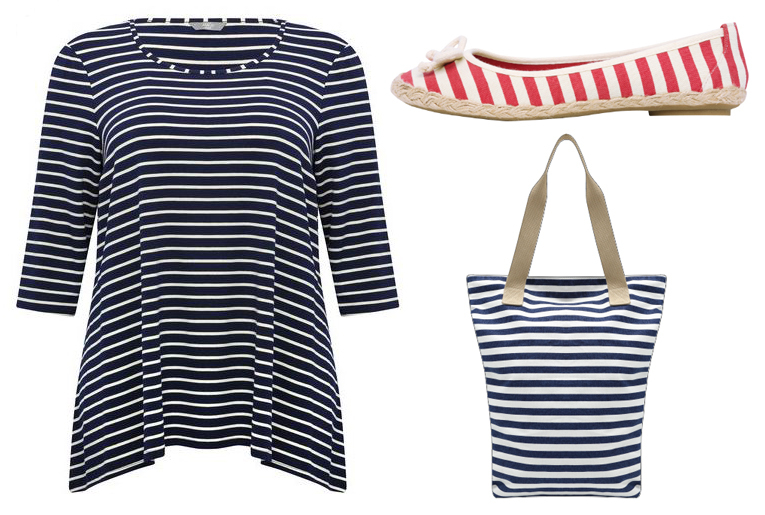 Their Plus Stripped Jersey Top (£26) is the perfect no fuss weekend top to throw over jeans, whilst their Stripe Canvas Pumps (£20) and Striped Beach Bag (£20) are just right for seaside adventures. Navy Mesh Jewel Magnetic Necklace (£5.99) from Quiz. If you're looking to inject a little sparkle into your nautical outfit, then look no further than this super cute Navy Mesh Jewel Magnetic Necklace (£5.99) from Quiz. Reminiscent of a knotted rope, the twisted mesh design has a clever magnetised fasten so it easy to get on and off if you usually struggle with jewellery. 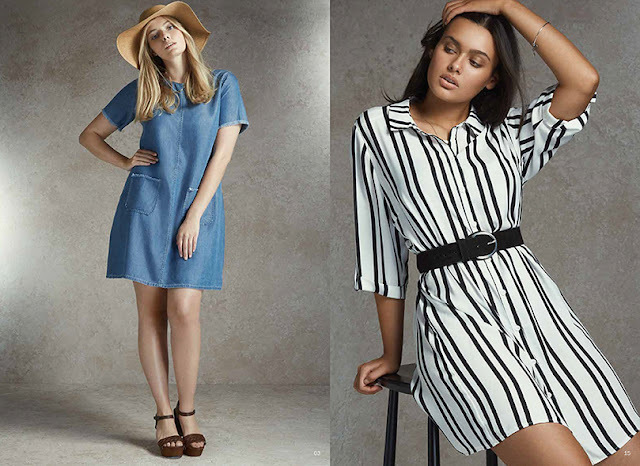 (l-r) Denim Dress (£40), Stripe Shirt Dress (£35) both from Simply Be. 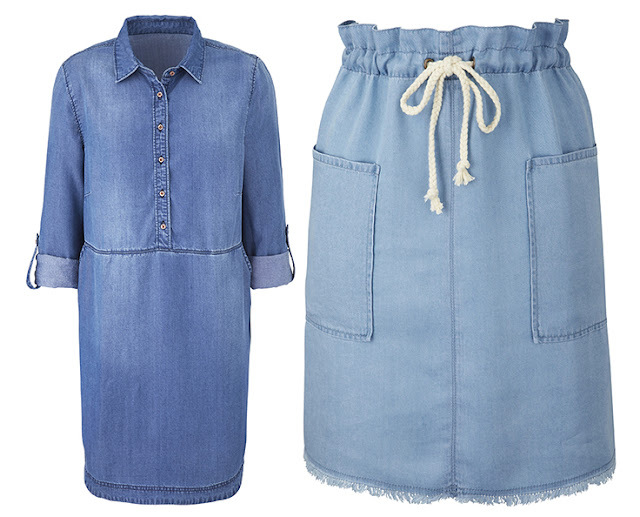 This simple Denim Dress (£40) from Simply Be just screams cute. Great teamed with straw hats and wedges, it's wonderful for a simple, laid back look. The Stripe Shirt Dress (£35) on the other hand means business. I'm a huge fan of what I've come to name deckchair dresses with their long, vertical stripes, but this one is smart, sleek and perfect for that transition from office to bar. F&F Striped Open Back Swing Dress (£10) from F&F. My final pick is this pretty Striped Open Back Swing Dress (£10) from F&F. This is one of those perfect dresses for a hot, sticky day where you want to feel the breeze hit your skin. The open back and sleeveless design also make it great for throwing over a swimsuit as you make your way to the beach or swimming pool, and is a versatile addition to any holiday suitcase. I'm so excited for the summer to hit now - what are your essentials? Don't forget to let me know in the comments. 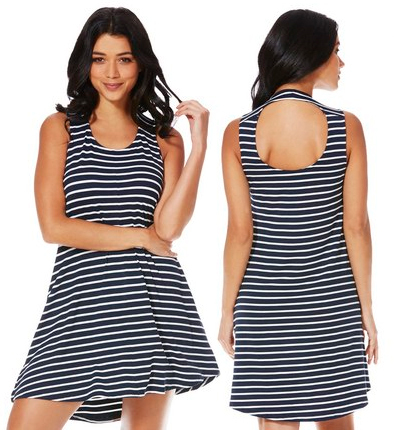 I love that striped swing dress & I am desperate for a soft denim skater skirt.